Asai, S., Shirasu, K. and Jones, J. D. (2015). Hyaloperonospora arabidopsidis (Downy Mildew) Infection Assay in Arabidopsis. Bio-protocol 5(20): e1627. DOI: 10.21769/BioProtoc.1627. Hyaloperonospora arabidopsidis (Hpa; formerly Peronospora parasitica or Hyaloperonospora parasitica) is an oomycete downy mildew pathogen of the model plant Arabidopsis. 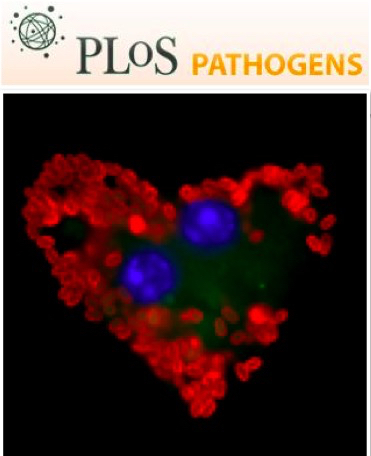 The pathosystem between Arabidopsis and Hpa has been extensively used to study host/pathogen co-evolution (Coates and Beynon, 2010). As Hpa is an obligate biotrophic pathogen, its host is absolutely required for survival. Thus, Hpa must be maintained on susceptible Arabidopsis accessions and mutants. Growth of Hpa is evaluated in two ways; counting conidiospores (Asai et al., 2014) or counting sporangiophores after trypan blue staining (Holt et al., 2005). Here, we describe how to do inoculation with Hpa and how to evaluate Hpa growth on Arabidopsis. Note: Currently, it is “EMD Millipore Corporation, catalog number: 475855”. Arabidopsis lines and Hpa isolate. Ws-2 eds1-1 mutants [the accession previously reported as Ws-0 is in fact Ws-2 (Parker et al., 1996)] and Col-0 plants were used as susceptible and resistant accessions of Arabidopsis for Hpa isolate Emoy2, respectively. Sterilize scissors and inside of the biological safety cabinet using 70% ethanol. 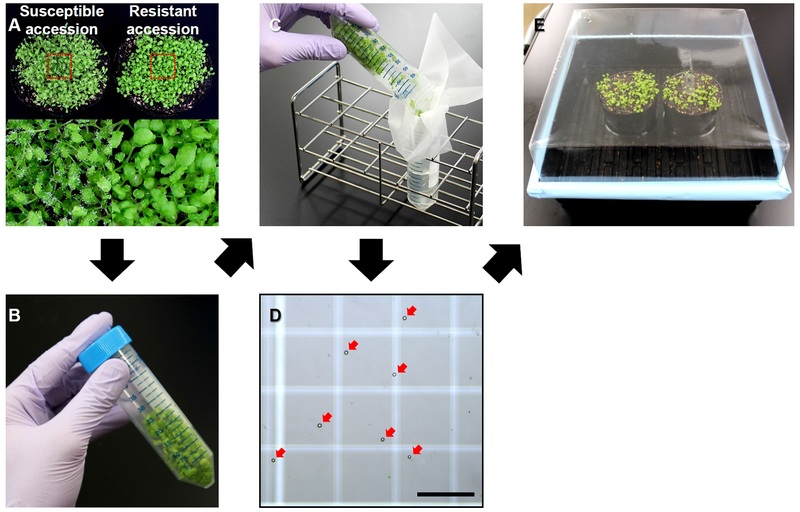 Open a plastic tray with a transparent lid containing Arabidopsis plants that are densely covered by sporangiophores (Figure 1A) in biological safety cabinet to avoid diffusion of conidiospores. Note: To check contamination of different isolate(s) of Hpa, using both susceptible and resistant Arabidopsis accessions for propagation of Hpa is recommended (Figure 1A). Harvest aerial parts of the Arabidopsis plants in a 50 ml conical tube (Figure 1B). Note: Fill the tissues up to 20 ml marker on the tube (see Figure 1B). Avoid any soil contaminations because it may cause propagation of soil inhabiting pathogens. Put 15 ml sterile water in the 50 ml conical tube and shake it gently several times to obtain sporangia in water. Filter the obtained suspension using Miracloth (Figure 1C). Measure the concentration of conidiospores in the suspension using a hemacytometer (Figure 1D) and dilute with water to a concentration of 5 x 104 conidiospores per ml water. Note: To know how to count with hemacytometer, check the link (http://www.hemocytometer.org/). Saturate Arabidopsis plants with the suspension by spraying using Airbrush Kit. Note: Usually, 2-week-old plants and 5-day-old seedlings are used for evaluation of Hpa growth by counting conidiospores and counting sporangiophores, respectively. 2-week-old plants are used for propagation of Hpa. Arabidopsis plants are grown at 22 °C and 60% humidity under a 10 h photoperiod in environmentally controlled growth cabinets. Place the inoculated plants in a plastic tray with a transparent lid to maintain high humidity (90-100%) conditions (Figure 1E). Note: High humidity is very important for growth of Hpa. Thus, sealing off a plastic tray with a transparent lid using Labeling Tape is recommended. Incubate the Hpa-inoculated plants in a growth chamber at 16 °C under a 10 h photoperiod until the day of sampling. Note: Timing of sampling depends on the combinations of Hpa isolates and Arabidopsis accessions. Usually, from 4 to 7 days after the inoculation would be the proper timing. Figure 1. Procedure of inoculation with Hpa. A. Susceptible and resistant accessions of Arabidopsis 7 days after inoculation with Hpa. Ws-2 eds1-1 mutants (the accession previously reported as Ws-0 is in fact Ws-2; (Parker et al., 1996) and Col-0 plants were used as susceptible and resistant accessions of Arabidopsis for Hpa isolate Emoy2, respectively. Red boxes: Close-up shown in lower photographs. B. Arabidopsis plants harvested in 50 ml conical tube. C. The illustration of filtering the obtained suspension using Miracloth. D. An image of conidiospores on a hemacytometer. Red arrows indicate conidiospores. Scale bars = 200 μm. E. A plastic tray with a transparent lid containing Hpa-inoculated Arabidopsis plants. Harvest aerial parts of Hpa-inoculated plants in a 50 ml conical tube with sterile water. Note: The number of replicates and plants per replicate is dependent on the experimental design. Usually, we harvest 5 pools, each consisting of 3 plants in 1 ml water (total 15 plants) for each Hpa-inoculated Arabidopsis line. Count the number of conidiospores released in water using a hemacytometer (see Figure 1D). Pat the plants dry on paper towels and measure their fresh weight. Note: Growth of Hpa is represented as the number of conidiospores per ml water per gram fresh weight (conidiospores ml-1 g-1 FW). The intensity of disease symptom (the number of conidiospores) is variable, dependent on several conditions such as humidity, the intensity of light, timing for inoculation and age of host plants. The conditions can be controlled in each experiment by placing all the plant materials (e.g. WT and all the investigating mutants) in the same tray during infection. Note: Protective wear should be applied at all steps because trypan blue solution and chloral hydrate are highly toxic chemicals. Harvest aerial parts of Hpa-inoculated seedlings in 50 ml conical tube and just cover the harvested seedlings with trypan blue solution. Note: At least 50 cotyledons for each of the investigating lines should be sampled. Boil for 1 min in water bath in fume hood. Incubate for 1 h at room temperature. Replace trypan blue solution with chloral hydrate solution and leave overnight on Labo shaker at room temperature. Replace chloral hydrate solution with 60% glycerol. Count the number of sporangiophores per cotyledon using a stereomicroscope. Figure 2. Typan blue-stained cotyledons. Resistant (left) and susceptible (right) accessions of Arabidopsis 7 days after inoculation with Hpa. Col-0 plants (left) and Ws-2 eds1-1 mutants (right) were used as resistant and susceptible accessions of Arabidopsis for Hpa isolate Emoy2, respectively. Yellow arrows indicate the hypersensitive response (HR), a programmed cell death that is commonly associated with plant disease resistance. Red arrows indicate sporangiophores. The working solution is prepared by diluting the above solution with ethanol (1:1 v/v) and storing at room temperature. Add around 200 ml of sterile water and 500 g of chloral hydrate to a bottle and stir overnight in a fume hood. Our work was supported by the Gatsby Foundation (http://www.gatsby.org.uk/), JSPS KAKENHI 15K18651 (S. A.) and 24228008 (K. S.) and RIKEN Special Postdoctoral Research Fellowship (S. A.). We thank Timothy Westlake for his help with the manuscript. Coates, M. E. and Beynon, J. L. (2010). Hyaloperonospora Arabidopsidis as a pathogen model. Annu Rev Phytopathol 48: 329-345. Holt, B. F., 3rd, Belkhadir, Y. and Dangl, J. L. (2005). Antagonistic control of disease resistance protein stability in the plant immune system. Science 309(5736): 929-932. Parker, J. E., Holub, E. B., Frost, L. N., Falk, A., Gunn, N. D. and Daniels, M. J. (1996). Characterization of eds1, a mutation in Arabidopsis suppressing resistance to Peronospora parasitica specified by several different RPP genes. Plant Cell 8(11): 2033-2046. One possibility is that your conidiospore solution contains contamination of other pathogens (e.g. necrotrophs). Avoid any soil contaminations when you harvest aerial parts of the infected plants because it may cause propagation of soil inhabiting pathogens. Are you sure the plant is a Col-0 pad4 mutant?, you use water without any surfactants? Hope that your experiment goes well. hi，we have recently obtain Hpa.Noco from other lab and trying to use pad4-1 mutants for Hpa propagation. On the 4th day post inoculation we found necrosis-like spots on some of the leaves, and actually parts of some leaves are missing, which does not seem to be eaten by worms because these leaves are not near soil. Is there something wrong with our experiment? both Hpa and pad4 mutants were obtained from the other lab. the infected plants were in a 50mL tube so we are not sure about the contamination problem, and pad4 are Col-0 mutant as so we were told.and yes we use sterile water without surfactants. thx for your reply. I would take it as that our experiment somehow went wrong and try to find out the reason.